Someone needs to be court marshaled, but it isn't Lt. Col. Jason Amerine. 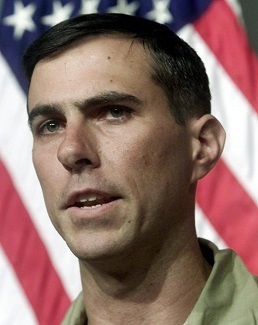 An Army war hero turned whistleblower told Congress Thursday that the military retaliated against him for talking to Congress about his plan to trade one Taliban warlord for at least six American and Canadian hostages, including Sgt. Bowe Bergdahl. Ultimately, the State Department insisted on a deal to free the Taliban five for just Bergdahl, and rejected his plans to secure the release of more hostages. Lt. Col. Jason Amerine testified Thursday before the Senate Homeland Security and Government Affairs Committee. Amerine is a Green Beret who the Army had treated as a war hero for his role in the 2001 invasion of Afghanistan, and who later helped the military promote recruitment through media appearances. He told the panel he was well into a plan to try to win the release of at least six Americans and Canadians. Aside from Bergdahl, Amerine was hoping to free Caitlin Coleman, who vanished in Afghanistan while pregnant in the fall of 2012, and her Canadian husband Josh Boyle. Coleman had a baby while in captivity.